Hekab Be Biblioteca ~ Open Road Community Library: Help HB Provide Another Of Summer Fun & Learning for Akumal Kids! 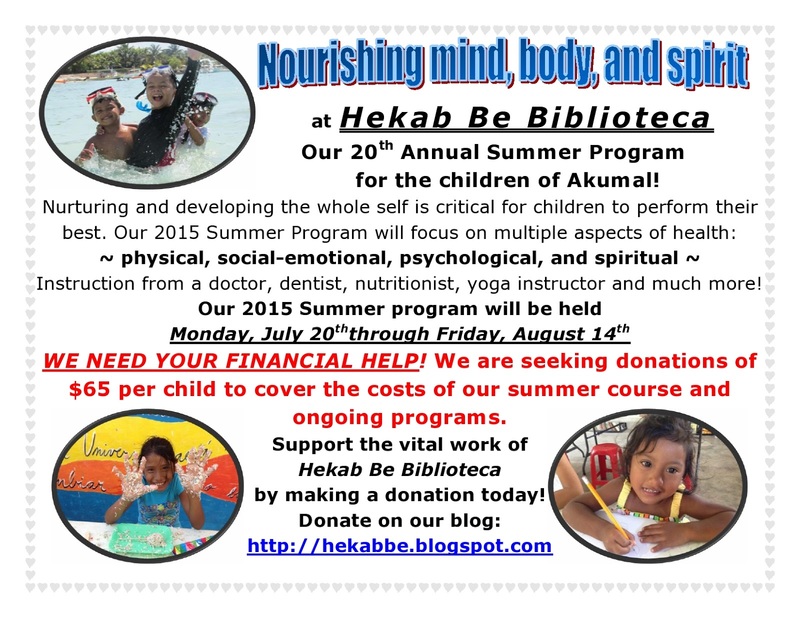 Help HB Provide Another Of Summer Fun & Learning for Akumal Kids! We are pleased to announce that once again HB will be hosting a month long summer program for the children of Akumal, ages 3-13. We provide this service to local families, free of charge, but in order to do this, we depend on the continuing support of our generous donors. Donate today by clicking HERE or on the donate button in the upper right hand corner of this page! Remember, we have reduced our online fundraisers to 3 times a year, so we need to raise more each time since we are asking you to give less often. We can't find the words to express how grateful we are for each and every person's donation, and size doesn't matter, what counts is that you give.